Berthold was a priest in Palestine. There were a lot of people living as hermits all over the region, each doing their own thing. Berthold got them together to live in a community on Mount Carmel. So, he helped start the Carmelite Order, which is still very large and active today. He was the first superior of the order, which means he created their rule of life. On Easter Sunday - just two days ago - many Christians in Palastine were gathered in a park to celebrate the Lord's Resurrection. Tragically, a terrorist killed more than 70 or them and injured hundreds others, just because they believe in Jesus. Today, ask St. Berthed to pray for those martyrs, for their families, for the Church in Palastine, and for all terrorists who hate Christians to convert and learn about the love of God. 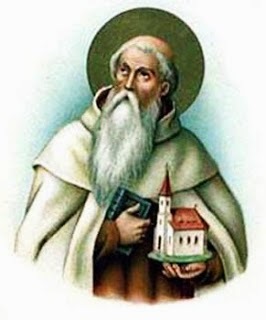 Saint Berthold, pray for us!